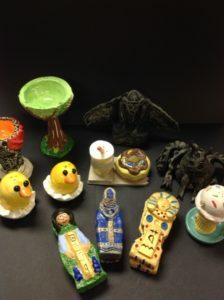 Sixth grade art students have been wrapping up quarter one learning about Mexican and South American cultural traditions. Our focus has been on Dia de los Muertos, a festive and colorful celebration of the departed which is takes place on November 1st and 2nd. 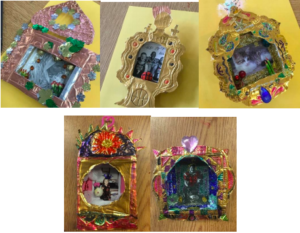 Students have been working with a variety of mixed media to create a personal “Nicho” that celebrates someone or something special in their lives. 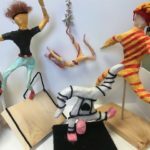 Can middle school feel like a circus? 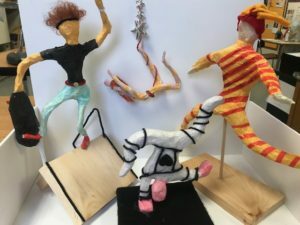 It is in the art rooms where Rundett’s eighth grade artists learned about Cirque du Soleil a unique theatrical performance that combines amazing physical talents and creative costumes. Students learned about the proportions of the human figure and then how to draw the figure in motion. We learned about Leonardo da Vinci’s Vitruvian Man and how every individual is an example of mathematically proportioned perfection. We then created a wire armature, padded it was foil and masking tape and then added tissue paper to build our performers. Students were challenge to design creative costumes adding fun details to their cirque creations. What have we been up to in September? 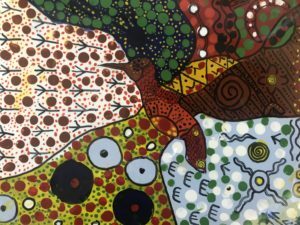 Our 6th grade artists have been learning about two very different cultures. 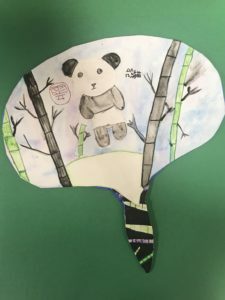 In Mrs. Bednaz’s class, students focused on Asian culture; from their beautiful landscape and nature paintings to the art of calligraphy and the artist’s seal. 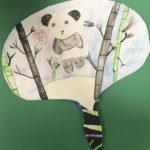 Each artist came up with their own painted fan using watercolor as their medium. 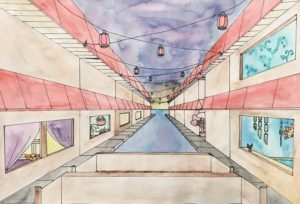 Our 7th grade artists have been learning about how the elements of design can be used to create unique and balanced compositions. Line illusions and patterns were highlighted in many of these, which made for some very successful compositions! Rundlett grade 8 art students are completing their first summative assessment. Students learned about careful observation as an essential element in creating a quality technical drawing.Mrs. Bednaz class observed skulls both human and animal. They learned about the famous artist Georgia O’Keeffe, anatomy, observational drawing and rendering form using value. Students were then challenge to add their own unique idea to their skull as a fun creative component. Mrs Kashi’s and Mrs. Nyhan’s class observed potted succulent plants and created beautiful compositions. 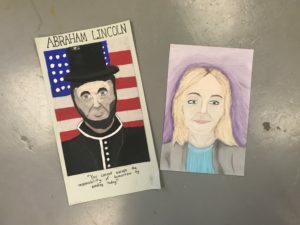 They learned about Georgia O’Keeffe, creating value with watercolors and color theory. Keep your eye out in the halls of blue duke nation for these exciting works on display. WELCOME BACK from the RMS ART Department. All RMS students have art for at least one quarter each school year. If they’re lucky, some of them might even get a second helping! 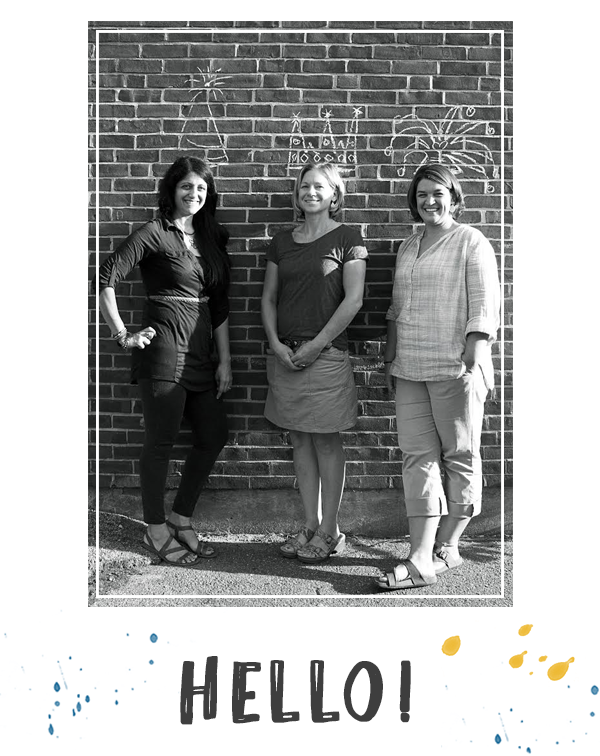 We look forward to an inspiring year with your child; working in a variety of media and exploring culture and creativity through art. 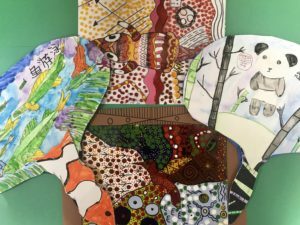 Art is a fun, hands-on learning opportunity that encourages 21st century skills. The art department is in need of aprons, if you have any to donate, please send them to Ms. Bednaz in room 507. Thank you! Hear ye, hear ye. Come one, come all! 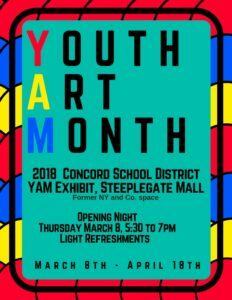 Concord School District’s annual Youth Art Month Exhibit at the Steeplegate Mall. Opening Night is Thursday March 8th from 5:30 to 7:30. Light Refreshments, Live Music and lots and lots of Art. Exhibit will run between March 8th to April 18th. See you there! Scholastic Art and Writing Award Winners! 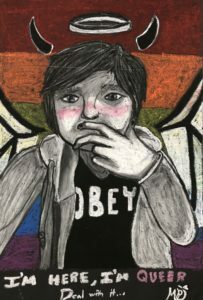 This year we submitted a small number of work for Scholastic’s Art and Writing Awards. 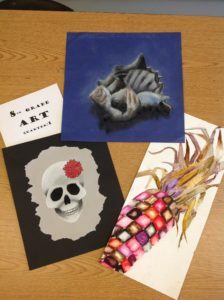 Congratulations to Rundlett Middle School art students who won 2 Silver Keys, and 2 Honorable Mentions. 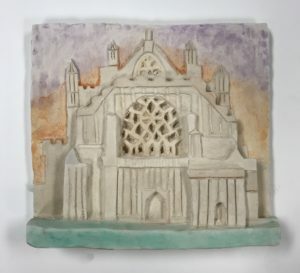 The following 8th grade students won: Rae Lynn Shi won a silver key for her painting “Shared Spaces” and a honorable mention for her ceramic piece “Cathedral of Exeter”. 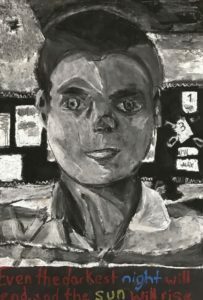 Lex Pelley won a silver key for his self-portrait “I’m Here, I’m Queer, Deal with It” and Ryan Sheehan received an honorable mention for his self-portrait “Even the Darkest Night Will End, and the Sun Will Rise”. These students will be recognized at the Stockbridge Theater on the campus of Pinkerton Academy during two ceremonies on Sunday February 4th at noon. Their work will also be displayed at the same location from January 16th – February 4th. 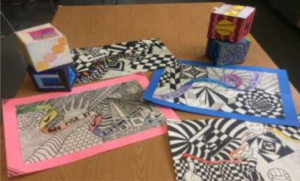 Students in Mrs. Nyhan’s 8th grade art classes have had the incredible opportunity of working with LittleBits technology to create animated kinetic sculptures. 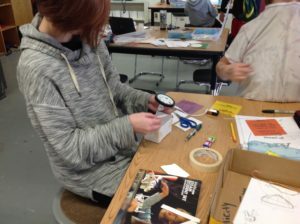 The art department received a grant from the Concord Trust last spring to purchase LittleBits STEAM kits for all art students to use. 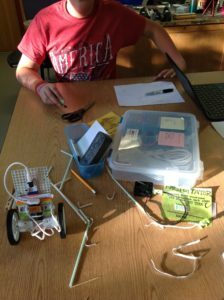 LittleBits are circuitry bricks that can be connected to animate and bring sculpture and inventive prototypes to the next level. Students had the opportunity to build on being effective collaborators and creative producers though this process. Mrs. Kashi’s and Mrs. Bednaz’s classes will be also using these in the weeks to come. Stay tuned! 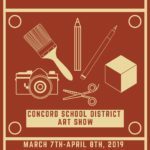 Visit http://concordtrust.org/ for more information on exciting opportunities that are happening in our schools and ways you can support them. The Rundlett Middle School art department would like to thank all their first quarter art students for their hard work and perseverance! 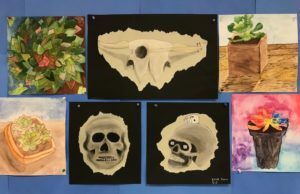 It was a busy first quarter with each grade completing three major summative assignments – drawings, paintings and a clay sculptures. Please be sure to ask your students about their work – most of them should have found their way home. You can always see fine examples of our students amazing art abilities in the halls of Rundlett. 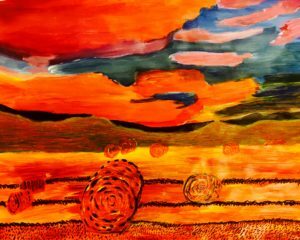 We look forward to continuing our art making with quarter two Rundett artists! Students have been diligently finishing their technical drawings. In Mrs. Bednaz’s class, students are drawing skulls and creating a range of values using pastels. Meanwhile, in Mrs. Nyhan, students have been drawing ears of corn using watercolor to create value. And finally in Mrs. Kashi’s class students have been drawing shells and using pastels to create value. All were inspired by the works of Georgia O’Keeffe. We are so excited to finally have this page launched. This has been a vision of ours for some time. Our goal is to keep you all posted on what’s going on at Rundlett Middle School from week to week. Don’t forget to check the calendar frequently, we will keep all events related to us in the art department on the calendar, this should help with NJAHS students in particular. 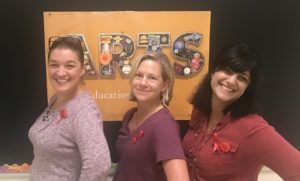 We are Stephanie Bednaz, Somayeh Kashi, and Kristi Nyhan and this is Art 4 RMS, where you can get the latest happenings in and out of the art room. This is not giving you a lot of detail about us, is it? So read more here.